Despite the unwavering spate of modernity, calabash that is largely used as domestic utensils across communities in the northern part of the country, has defied extinction unlike many other similar utensils. Craftsmen that are into the art of carving and painting of calabash ancestrally are not only fully in business but also attract people outside those known to have been patronising their products. This speaks volume of the long standing patronage of calabash, though not without some setbacks, as the patronage now seems to have been only restricted to the Fulani women, who have been using calabash since. Calabashes come in different sizes, painting and designs that attract patronage. The Fulani women, use calabashes not only for the age-long hawking of cow milk but also use, those carved with designs for house decoration. 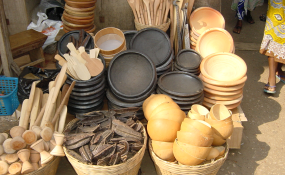 When Chronicle visited Shuwarin Market in Kiyawa local government area of Jigawa state, it discovered that the business of calabash is a department of its own in the market as craftsmen that specialized in the art of piping, perforation, carving, designing and painting, were at their best. The buyers, mostly Fulani women, were seen going from one stall to other haggling in an effort to get not only a lower price but also a quality product. Raw calabashes are supplied to Jigawa state from Gombe, Sokoto and some parts of Bauchi and Adamawa state. The craftsmen cut the rounded calabash in to two equal sizes by using a saw blade (Madahuro) while a special knife (Gizago) is used in carving out the inner unwanted substances. After this a special wood (Mahuri) is used for softening the inner part of the calabash before embarking on the outer design and painting. Speaking to Chronicle, a 60-year-old calabash carver, Sa'idu Kofar Gabarin, said he has been in the business since childhood adding that the trade runs through the family. Recalling, he said even in those days, women have been their only customers though, the patronage was not restricted to Fulani women as it is the case now. He said he was too young then to recall how much his parents were making from the business but he can remember many women patronize his father. He said his father normally sold all his products at home and did not need to take them to the market. The high level of patronage then might not be unconnected to the fact that calabash was the only tool for most of the domestic chores. Idris Adamu of Dahuwa, another calabash trader, said he learned the art from his father. He said initially he was making enough money from his sales to meet his needs but over time the patronage started dropping. He said when they realised that the patronage was dwindling due to the advent of plastic products they had come up with some innovations. The designs and painting, introduced assisted in keeping the business alive. "Among the designs and the painting, there are Dedal, Fal (complete painting), Farin Baki (white painting at the upper edges of the calabash) as well as Hakorin Hajia painting (golden color painting). We are not only painting calabashes but other kitchen utensils. "I can produced 30 painted calabashes in a day. Largely our customers are Fulani women so we create designs to attract them. The season for high sales is usually when they are migrating. They buy in large quantity and they go for the highly decorated ones during wedding and other ceremonies. The smaller painted calabashes are usually purchased for the bride. They are normally arranged in a wooden cupboard as decoration." Adamu said all his children have acquired the skills of calabash making and was confident that they would continue with the tradition but would not be surprised if they take on other jobs. Hajia Baba Rahine, 62, told Kano Chronicle that she still uses calabash for her minor chores, saying in her younger days plastic product were not available and calabash was being used for all household chores. She added that all her three daughters, who are all married, do not use calabash in their respective homes as plastic utensils have replaced it. Salame Buba, is a Fulani woman, who this reporter met after she bought two big size calabashes. She said that she use calabashes for hawking cow milk. She said she bought them at the cost N950 each. She said she normally takes into consideration the designs and painting on the calabash before buying and does not mind the cost. "Those that you are seeing as cheaper ones they don't have design and painting. For us, this design that you are seeing is what makes a calabash. It pleases our minds just by merely looking at a well decorated calabash. It even attracts customers for us when we are selling cow milk. So you can see the reason why we go for them."